The A.R.C. Balaclava Face Mask is a great addition to staying warm on cold weather rides. The face mask can be worn alone, with goggles or will fit comfortably underneath your helmet. The A.R.C Balaclava Facemask is made from stretchable smooth fabric and light insulation that has excellent moisture management. So don’t let the cold weather stop you, get an A.R.C Balaclava Face Mask and continue to do what you love to do the most "RIDE". Made to fit comfortably under your helmet. Offers great cold weather protection and wind protection on your face and neck. Made from breathable and stretchy nylon/lycra material. Fits pretty well under your helmet, and helps keep the wind off of your face when you're out doing dumb stuff in the snow on your dirtbike. Fits well under your riding helmet without making it fit too tight. Its not super heavy, but it works well for winter rides on dirt bikes. Works perfect under your helmet to help keep your face warm and to keep extra dust out of your mouth/ears. I wear a size medium helmet and it fits perfectly. If you are a XXL type head guy it may be too small. As advertised, and you look like like a ninja, scared the heck out of the wife! Keeps ya warm for sure! great price and keeps the kids from complaining its cold. Happy trails to all. This works great, packs small and feels good on cool days. Great for the money!!! Works well to eliminate the chill on your face. Not too thick to make your helmet tight. Just enough to keep the chill off of your face & neck. used it with a 3/4 helmet with no face shield in October above Central City Colorado. With temps in the 30s and winds up to 50 mph, I was more than surprised how warm it kept my face. Very pleased with the purchase. Great fit under your helmet and can be easily lulled up or down with your helmet already on. I even use this in warm weather to protect my neck from the sun and to absorb sweat. As for cold weather, this only made a marginal difference. I went for a ride in 40° weather and my lips and nose got cold very quickly. Good just could be a little thicker material. Good piece of cold weather gear. Fits underneath the helmet great. Length is long enough to cover the neck. Great price! You really can't beat this for the money and it's barely noticeable when wearing. I was riding in 30 degree weather and had to take it off due to getting so warm. I realize these were cheap to buy, but performance is not good. Condensation builds up inside badly and seems to make your face even colder. Will spend the extra money next time. The mask is very light weight and breathable. For winter riding it will be no good but for the dunes or just protection from the sun it is excellent. It fits good and is warm. I would buy another one. Loosing heat means your losing energy. I've always thought a balaclava was unnecessary but figured for 5 bucks why not give it a try? Glad I did, not only is it good for cold weather motorcycle rides, I use it when snowplowing. Of course you could use it hiking etc. Just buy it, you won't regret it. This product is great with its fitment and quality but is meant for cool fall or warmer winter weather. I've tried riding with this balaclava in below freezing and it did not perform as well but still reduced the wind chill a bit! 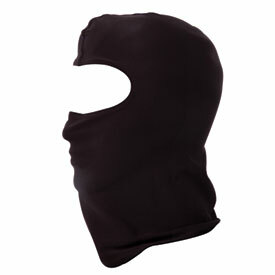 A very thin, simple balaclava that works great! It never stretches out and has held up well. It really helps keeping the cold air off your face and neck. I use it on very cold, studded-tire, winter rides in NE Ohio. Cheap enough that I bought extras as a small Christmas gift for my riding buds! Thanks Rocky MTN! very good for the money, kept me warm and fit well under my helmet. Works just fine where it covers but it is very short. You will not be able to tuck it under a jacket or jersey. Seems pointless to make this and leave it so short cold air hits your neck. This is perfect for riding in climates where day time riding temperatures are nice but morning and evening riding can get cool. I keep this in my backpack and if it is cold out I can throw it on at anytime. This is a great face mask for riding on cooler days. I wouldn't recommend this if you can see your breath in the air. It doesn't hold moisture which is great. I have washed this several times and it is still holding up well. Very comfortable and fits good. Can't beat the price. I love the Balaclava. Makes for harsh winter riding enjoyable on the face. Even after it gets wet from sweat or rain it doesn't get instantly cold, it stays warm as it traps the warmth inside. Wash it often on gentle and you'll love your new addition to your gear collection! I got this item on one of the promotional sales and it has been a great value. I use for riding, plowing snow, etc and it is long enough to cover your neck and does keep you warm. It's pretty thin so you can get your helmet over it easily. And it works. Hard to beat for the price; it's thin, but might not fit in a helmet well otherwise. Well made and great for days that are a little cold, or to keep some of that dust out of your nose/mouth. If you live where winters are as long as summer, then this mask is a must. Fit well, didn't bunch under my helmet and was pleasant against my skin. Keeps my face warm and makes me look like a bank robber, so win win for me. I have owned several of these over the years. This brand is well stitched and the seams are low profile so the don't create "hot spots" under the helmet. Bought them on sale so outstanding price. Decent fabric, keeps you warm. Nothing more needs to be said. Can't complain about this product. It works. Definitely kept my face much warmer than without it. Feels fairly thin to the touch, but does what it needs to. This item is great for the price. It works great for under the helmet on those cold days. Good for those early spring/late fall rides when you need just a bit more warmth. It is pretty thin, used it snowmobiling and it wasn't quite warm enough, but still helped. Got this on special and it works well on those cold rides. My face mask nice I love it. I use the mask when I was cutting wood over my head, keeps everything out. Also when I ride in the cool weather. Perfect for the colder weather. Very comfortable and light . . Like everything else A.R.C 100% effective, top notch quality for a super low price.. a must have in cold weather riding.. I first used these at night on street rides, then under our helmets at night on quads, now we use them in our buggy. They work. Just enough to take the edge off of cold weather. And the kids all call them "ninja masks"